People look for many things in a well-appointed kitchen: high-end appliances, lots of prep space, good lighting, and sufficient space with good flow so that the kitchen won’t feel crowded when a lot of people are in it. But what if we told you the most overlooked feature is also one of the most important? It’s the pantry. Whether yours is big or small, functional or showy, your kitchen depends on your pantry organization. A well-designed pantry keeps everything you need at your fingertips and prevents things like toasters and coffee machines from cluttering your countertops. Is your pantry disorganized? Is the contents spilling into your kitchen and destroying the atmosphere you originally created? Here are a few ideas to help you whip your pantry organization into shape. The goal of a pantry is to provide storage, streamline kitchen activities, and make the kitchen work better for you in general. Therefore, what makes a perfect pantry can be very personal. And what worked for you in the past may not be working for you now. The pantry needs to be highly functional, taking the place of the kitchen when possible. Here are some suggestions for pantry organization, depending on the size and style of the available space. Shelves for storing appliances. Pantries aren’t only for storing food! Opt for adjustable shelving so you can store appliances in your pantry, keeping your kitchen counters clear. Cookbook storage. Cookbooks kept in the pantry rather than the kitchen are still close at hand when you need them. Counter space. If you have a large pantry, it makes sense to provide a counter where you can store dry good, house appliances, and even do a little food prep if necessary. Coffee station. While you’re planning that counter space, why not make room for a coffee station? Keep your kitchen counters uncluttered by putting your coffee machine and everything you need to prepare coffee in the pantry. A desk for household planning. If you have the space in your pantry, consider a built-in desk where you can sit to clip coupons, making shopping lists, and do other household planning tasks. A mail station with envelopes and stamps is a nice addition. While it’s nice to imagine a pantry that’s big enough for every convenience, you can also make do with less. Here are a few tips for making the most of a small pantry. Install pullout shelving. When every square inch of space counts, you have to make sure it’s all equally accessible. Pullout shelving makes the rear corners accessible and facilitates good pantry organization. Opt for custom shelving. 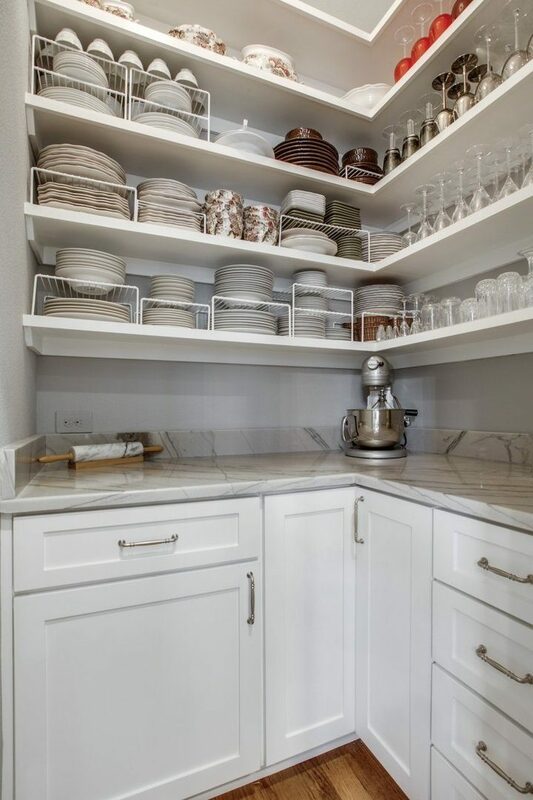 If you want to be able to store larger items like appliances, custom shelving will allow you to change the height of the shelves so that no space is lost. Look up. Don’t forget how much storage real estate there is above your head! Build shelving that goes all the way to the ceiling, and use the ceiling to hang pot racks or fruit baskets. Use every nook and cranny. There are many clever ways to turn wasted space into valuable storage. Browse sites like Pinterest and IKEA for pantry organization ideas and don’t forget to consult with your builder. You’ll be surprised at how many storage solutions there are for your pantry. When you have the space, nothing quite tops the elegance of a butler’s pantry. It can be anything from a small alcove or a walk-through between your kitchen and dining room to a dedicated room usually positioned near the dining room to facilitate entertaining. Here are a few features to consider in your butler’s pantry. All too often a pantry is almost an afterthought to a kitchen, but that is changing. Contractors and homeowners alike are realizing the importance of a well-appointed pantry. Whether you are redesigning your pantry, remodeling your kitchen, or in the market for a new home, make sure you plan a pantry that will work for you. The holidays will be here before you know it. If you're hosting, you know kitchen organization is key! Here are 5 tips to help you organize your holiday kitchen.